It’s a clear, warm night, breezy and calm with a languorous quality to the air. A night for strolling arm in arm along the surging beach; a night for hiking to the top of the mountain to gaze out at the moonlit landscape below. It’s a blue moon night, the second full moon of the month–a rare occurrence, like a leap year, that feels like a gift of cosmic significance. Such a night makes me want to take a chance and send out into the world some ideas that I have been holding close, not daring to share for fear of—of what? Being scoffed at or ignored, I suppose. But once in a blue moon, it’s important to reach beyond those fears and write from the heart. On this quiet, moonlit night, I am thinking about death. Every near-death experience describes a peaceful opening up to the light in the seconds after death—a state of rapture, a sense of leaving the body with all its frailties behind and moving into a new state of consciousness. If death is just a transition into a different relation to matter and spiritual consciousness, then it is not something to be afraid of. It is a change, but not a negative one, except to the extent that we remain attached to those we love and our dear, familiar places. No other being on the planet frets so over death as does humankind. All others simply pass, unworried, into the next stage of existence, whatever it may be. If there is no reason to fear or worry about our individual deaths, then maybe there is no reason to fear or worry about the coming planetary cataclysm. All of us living beings on the planet now will simply transition into whatever comes next, as we have many many times before in our cosmic journey from stardust to our current terrestrial physical forms. Even the fear that we have of destroying our planet to such an extent that it will become unlivable is not tenable. I don’t believe we could do such a thorough job of destruction as to make the environment completely and irrevocably toxic. It may take millennia, but eventually, as it has in the past, the Earth will regenerate and give birth to new life forms. And we, because we are part and parcel of this ecological sphere, will be part of those too. Just as now we “remember” our past as sea creatures through the saltiness of our blood and the way we are able to swim underwater in our mother’s wombs, we will in some way retain the traces of our time as humans on the planet. Hopefully the traits that have proven so destructive and psychotic will not persist: our violence, our fears and insecurities, our short-sightedness, our competitiveness, our greed. It is possible that we are now living through a blue moon period of a much greater magnitude than just one lunar cycle. Once in a blue moon, a dominant species—like the dinosaurs—collapses. It is our fortune, for better or worse, to be living through this rare epoch, the last days of a closing era—and unlike the dinosaurs, to be conscious of what is taking place as it happens. Of course, once in a blue moon, too, a species is able to pull back from the brink of extinction and keep going a while longer. 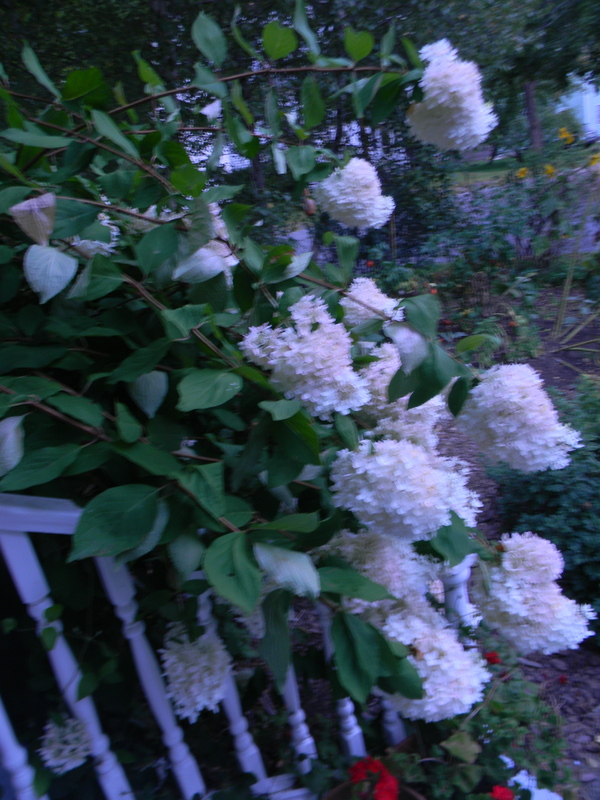 On this blue moon evening, I pay loving homage to the white hydrangeas glowing in the dusky interlude between sunset and moonrise. 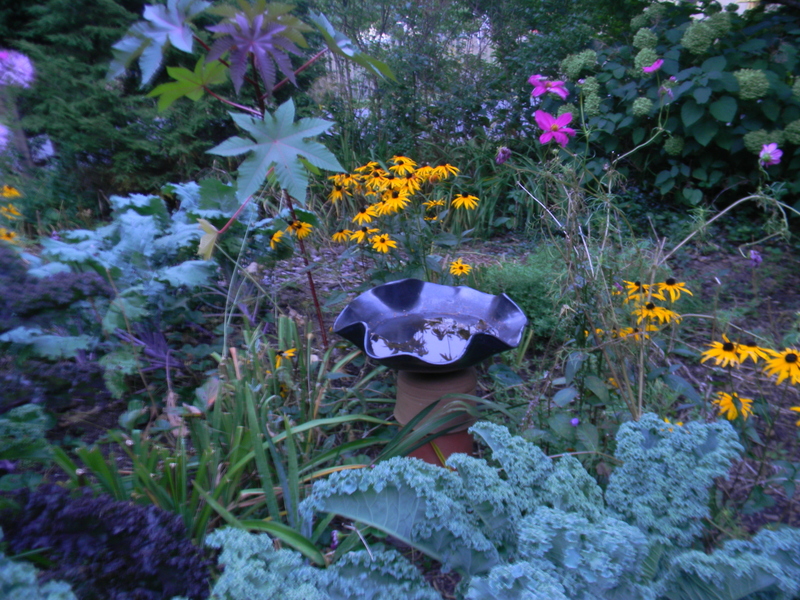 The perky round sunflowers, the curly purple kale standing stiff and tall in my garden, the pulsing background chorus of crickets—I gather them round in a loving embrace and give thanks for this quiet blue moment, however long it may last. Far from inviting scoffing, I think you have captured the essence of our human condition. On a cosmic scale–the scale that created our planet and the sun and moon that illuminate it–humans are nothing. Less than nothing. And yet we have been blessed (or cursed) with consciousness, including the awareness of our place among things and our individual and collective demise. The way we respond to this knowledge defines us. Do we put faith in a higher power we cannot see, hoping that he/she/it will relieve us of the burden of wrestling with the difficult questions? Do we embrace hedonism, investing our energy in having fun, since tomorrow we will not be here? Or do we live, as so many of us do, with the anguish of our awareness, trying to forge meaning and connection in the face of an indifferent cosmos? I put myself in the last category, as I am sure many humanists and intellectuals do. It’s not an easy path to walk, but I don’t see any alternative. I can understand thinking and saying these things. I once said something similar, but much condensed, at a Transition Town meeting. But afterwards, I found that I was uncomfortable with what I said. I tried to determine what was I thinking and feeling. I don’t have a definitive answer, but here are some thoughts. NOTE: I am NOT trying to say anything about what I or you should do. I am just “thinking out loud”. – I am uncomfortable with the idea of just giving up. For some reason, I want to struggle for a better world, to whatever extent I am capable of. – During the blitz in Great Britain, there were some who advocated surrendering. But I am very glad that Churchill was able to rally his country to fight on. – The United States is responsible for about 25% of the excess CO2 in the atmosphere, despite having only about 4.5% of the world’s population. There are many people in other countries who have created very little GHG (greenhouse gasses), who are suffering and going to suffer despite not being responsible for AGW. So it seems to me that the US has an obligation to counteract the CO2 somehow. – Thinking about the possibility of mankind going extinct makes me very sad, despite sometimes thinking the planet might be better without us. – I have been reading Living in Denial, which is giving a new perspective on how people respond to AGW. I believe that everyone is in denial, more or less. Which makes it hard for us to think clearly. – If the future will be grim for children and future children, don’t we adults have some responsibility to them? – Maybe we have some responsibilities to indigenous people? I am not giving up, Gerry, nor will I be. I just wanted to voice some of the ideas that come to me in my “bluest” moments, and keep me from total despair. I also wrote that post wanting to reach out to those who might have some wisdom to offer from the spiritual perspective, because I do believe there is more to us, and to this entire planet, than meets the eye. I have long studied shamanism and spiritual exploration of various kinds, and I believe there is a lot we have yet to understand on that score, which could help us if we could access it. Yes, I agree we have a great moral responsibility both as the lead polluter and creator of so much of the mess we’re in, and to our children and future generations. I have been wondering whether the faith-based communities are ever going to step up and acknowledge this, and start working for change, because they really could have a big impact. Extinction of all life? Given that our planet has gone through stages in the past where we were just a boiling pot of methane soup, I don’t give up hope that we could pass through it. What I was reaching for in this post was the question of whether “we,” in some form, will persist as part of this ecological web and therefore “come back” when the current deadly era blows over. My problem may be that I was born and raised in a Western country but, despite being brought-up going to Sunday School, one of my earliest memories is of being frightened of death; and of considering all belief in life after death as being wishful thinking… You say that no other animal worries about death but how could we know that? Many large mammals clearly exhibit behaviour that we would recognise as mourning the death of family members. I therefore suspect that animals simply don’t have time to ponder the futility of their existence; they are too busy fighting to survive to see the next sunrise. I think I was into my twenties before I read in the Bible that Jesus came to “…free those who all their lives were held in slavery by their fear of death.” This gave me some hope; but it was soon shattered when I also read that “…without faith it is impossible to please God, because anyone who comes to him must believe that he exists…”. I would love to believe the Christian Gospel but, sadly have struggled all my life with doubt; and finding out that God is not a Matchmaker (or that I mistook his signal) has left me doubting more than ever. However, with regret, I am unable to find solace in any other form of religious belief because I do not see beauty in the World around us; I see only futility. To me, what St Paul once told the people of Corinth seems entirely logical: “…if Christ has not been raised, your faith is futile…“. One thing I do not doubt is that there are always things we can learn from all forms of religious beliefs (especially aesthetic concern for life and nature in general). However – and here my rational scientific training may make me prejudiced – I do not believe God is a paranoid schizophrenic who keeps changing his story. Therefore, if He had wanted to ensure he communicated effectively with us, it seems very clear to me that the best way to do that would definitely have been to become one of us. Furthermore, whereas salvation by faith makes sense to me; I think salvation by works – in all its forms – deserves to be labelled (as Karl Marx did) as “the opiate of the masses”. I am not sure what you mean by this post being on a “taboo subject”–could you be more specific about what you see as taboo? My post is probably more Darwinian than Christian–seeing the world as a process of Natural Selection. Not coincidentally, I’ll be teaching a class in Darwin this coming week, so his theories and words are on my mind. In stark contrast to Victorian attitudes, death (i.e. 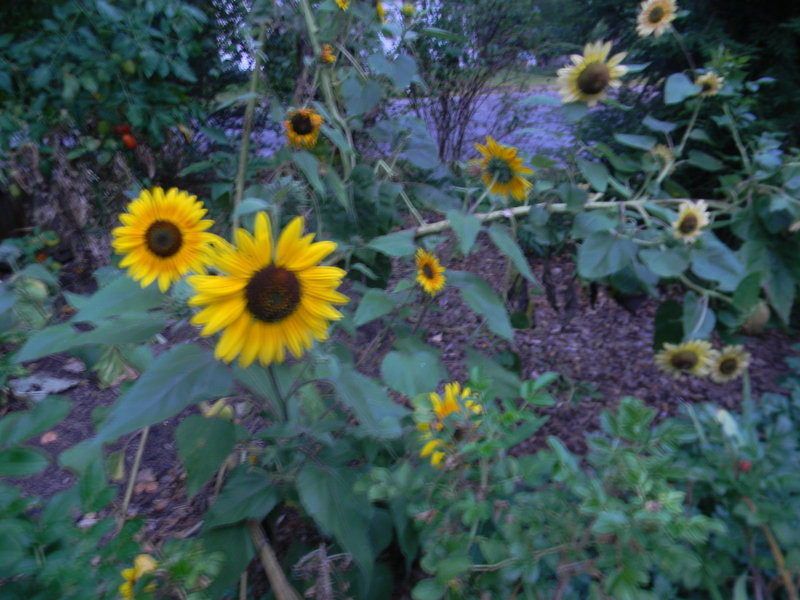 our own mortality) is a taboo subject for most people in Western countries today. Quoting Scripture is only appreciated by those that acknowledge that it might have some value and, since many do not, I am always now very wary of doing it. Therefore, I am very grateful to you for, as ever, being positive. In the 1980s, I spent 4 years working my way through a 3-year self-study programme for the Bible. Combined with regular church-going as a child (etc), this has left me very familiar with its content. I can usually quote chapter and verse references too (but I am sure that you are glad I did not). My favourite quote of Abraham Lincoln is this: “If all the people that fell asleep in Church were laid and-to-end, they would be a lot more comfortable!” To be sure, then, there are an awful lot of people who go to Church that do not understand the Christian faith (let alone live by it). However, in a World dominated by relativism, claims to absolute truth are no longer welcome, but, the fact remains that the Christian faith claims not to be a religion: Religions are human prescriptions for how one can or should try to make oneself acceptable to God (i.e. salvation by works), whereas Christianity is God’s revelation of a plan for humans who cannot make themselves acceptable to God by anything they do (i.e. salvation by faith). It is only the marketplace of ideas fallacy, which places greater importance upon tolerance and inclusivity than it does on truth and logic, that prevents most people from seeing this distinction (IMHO). Although I don’t think I ever believed in the literal truth of the Creation story (as told in the book of Genesis), I have thought long and hard about the interface between Christianity and Science ever since my teenage years (I had to work it out in order to study Geology seriously). Eventually, after 20 years, I uploaded all my thinking to the Internet; on my Falsifiable Theology pages (i.e. not an active blog). Therefore, I will not go on about it here at length. However, suffice it to say Darwin was one of the finest scientists that has ever lived, but his ideas should not be elevated to the status of a religion (IMHO). If you have not done so, I would recommend Desmond and Moore’s original biography of Darwin. Hmm, much to ponder here, Martin, especially on your earlier site. While I have always accepted evolution as common sense, I have problems with Darwin’s emphasis on “the battle for life,” and of course his racism and sexism is problematic–especially as people continue to use him as an excuse to continue these outdated ideologies. If we see life not as a “struggle for existence” but as an amazing process of intertwining synergies and symbioses, it shifts our perspective quite radically. One can no longer justify “manifest destiny” over “weaker peoples” or other species; and even Darwin’s more “pugnacious” male human can’t be viewed so approvingly. I don’t have time now for reading any more big tomes on Darwin…much more interested now in readings that can help me understand and prepare for the future…. I suspect, Jennifer, that you do not need to read Desmond and Moore’s book. On re-reading your comments here, I feel certain you are already well able to see Darwin and his ideas as a product of his times. However, I appreciate your taking the time to look at my Falsifiable Theology pages (written at a time when I was much more faith-full). On the subject of ponerology, so as to have equal chance of being noted by both you and Richard (and anyone else), I have inserted a new comment in the other thread.